Corporate Cocktail Power Hour: What women need to know...before the first date. What do EndAbuse4Good and WeWork have in common, besides a love of shared community? The answer is a desire to educate and protect women - at home and in the workplace. 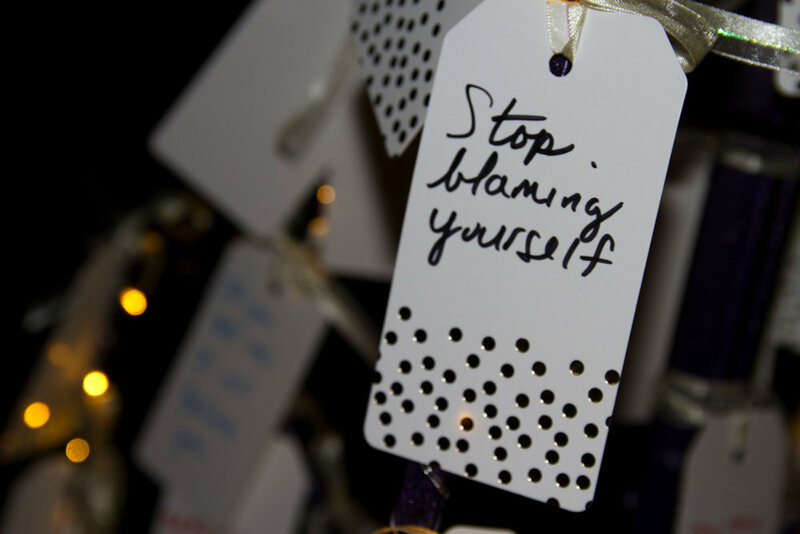 That's why we partnered up with their amazing FiDi staff to host a corporate cocktail power hour with a twist: sharing information about intimate partner abuse. "Come for the treats, stay for the very personal convo." 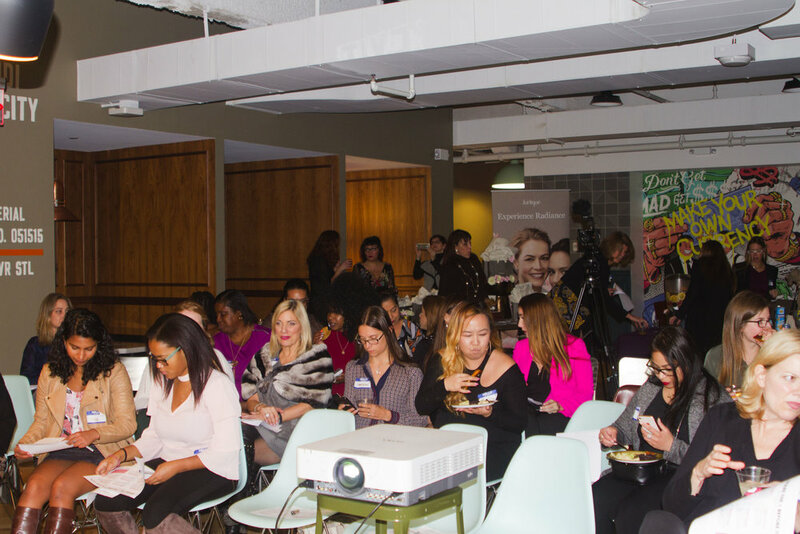 With 50 attendees at this RSVP only event, we had a packed room of professional women enjoying savory bites from Yumami, Roots Hummus and My Pretzel. There were boxes of gourmet Bouchard chocolate for everyone, piping hot Insomnia cookies and Prosecco cocktails. Just to round out the luxurious aura of this event, each woman received a Jurlique bag filled with beauty products AND we had gorgeous Share With clutches for prizes. EndAbuse4Good shared the 8 signs of abuse that don't include physical violence. We showed the insidious arc of abuse and shared ground breaking scientific information about how the victim's brain chemistry is altered, answering the question, "Why doesn't she just leave?" We identified the common traits of abusive partners, and helped attendees understand that there is no more need for remaining silent. "I had no idea how powerful the presentation would be! I was so moved and motivated to take care of myself!" "Absolutely this is essential to every woman of every age - it could prevent a world of harm." "Very informative and mind blowing." We laughed, and some of us cried a bit. We all learned and came away stronger than ever! Guests included the professional women of WeWork, members of the amazing Alpha Sigma Tau sorority, staff from Safe Horizon and the Ms Foundation For Women, EndAbuse4Good board members, the angel volunteers of Metamorphosis New York, assistant Vice President of Barclays, a New York Times/Psychology Today journalist and WeWork staff. A very special thank you to our volunteers Avery Kelly, Ashley Flores, Sonia Wong and Sofia Ciniglio! You helped make this event a great success! Great photos from super photographer Helene DeLillo and film from our #1 guy Nadeem Salaam of e9Productions! 1st Annual Shine A Light Save A Life - Mission Accomplished! 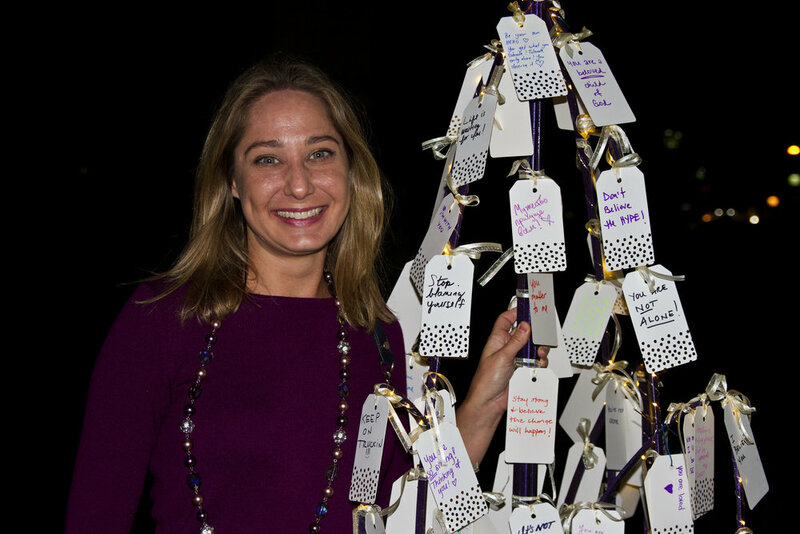 Thursday October 19 - it was a beautiful evening to shine a light on domestic abuse! 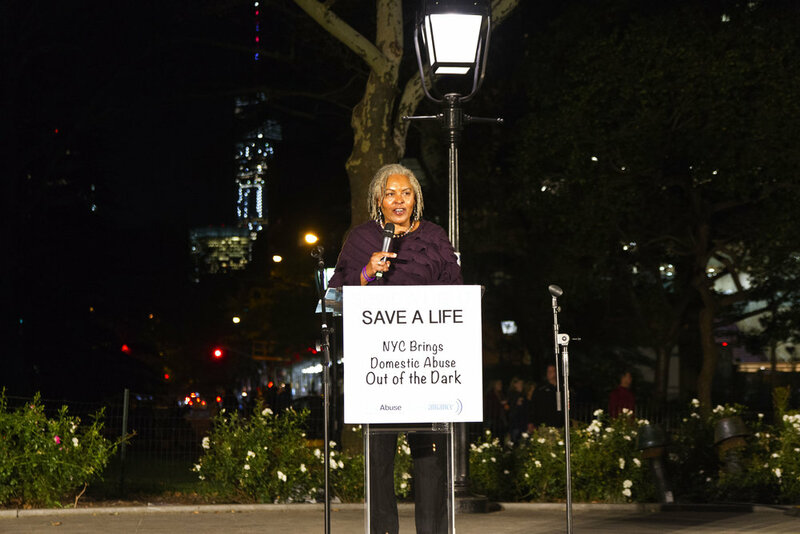 Information tables, candles, the Lotus Tree of Hope, powerful anti-abuse t-shirts from N.O.W and our amazing speakers all came together for our NYC community to help break the cycle of abuse. 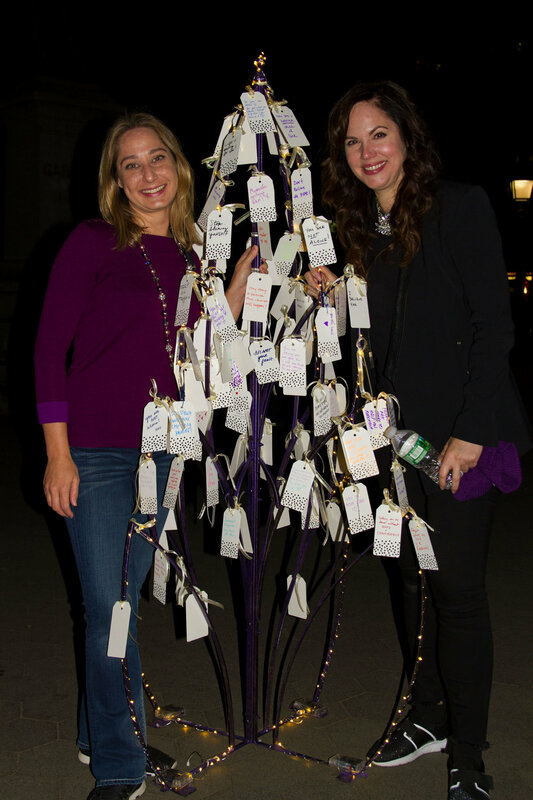 People from all over New York City and the world helped create the Lotus Tree of Hope by sharing hand written messages of encouragement to survivors of domestic abuse. 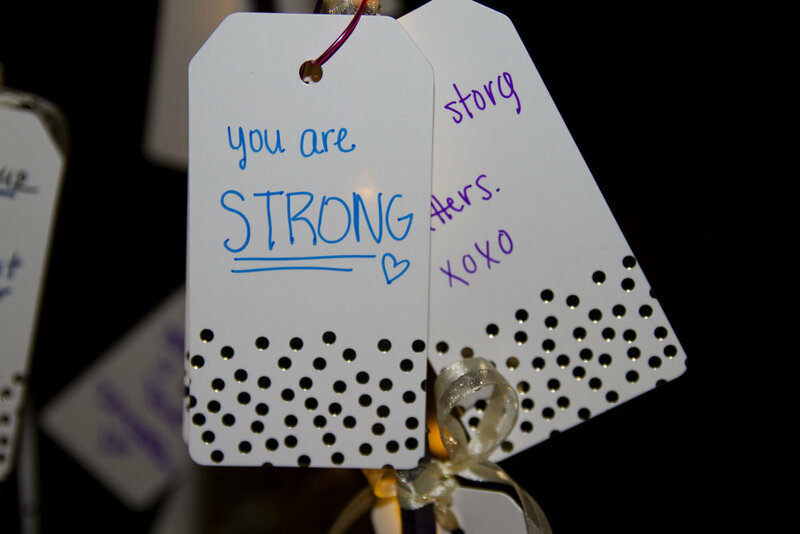 Their words were so inspiring that hundreds of park goers photographed and shared the cards on social media. Kicking off the action was Complicate the World Collective's super dance performance - I wasn't the only person watching who got a little emotional. It was pitch perfect: moving and uplifting. Honored guest speaker Gwen Wright, Executive Director of Governor Cuomo's Office for the Prevention of Domestic Violence showed us why she's the woman in charge! She kept it real with the crowd and through her personal sharing, reminded everyone present that women in abusive relationships will mistakenly blame themselves. Instead of leaving, they continue trying harder and harder to fix an unfixable situation. Gwen's sharing was also a great reminder that women who wind up in abusive relationships are often smart, caring, hard working, problem solving, stick to it individuals. 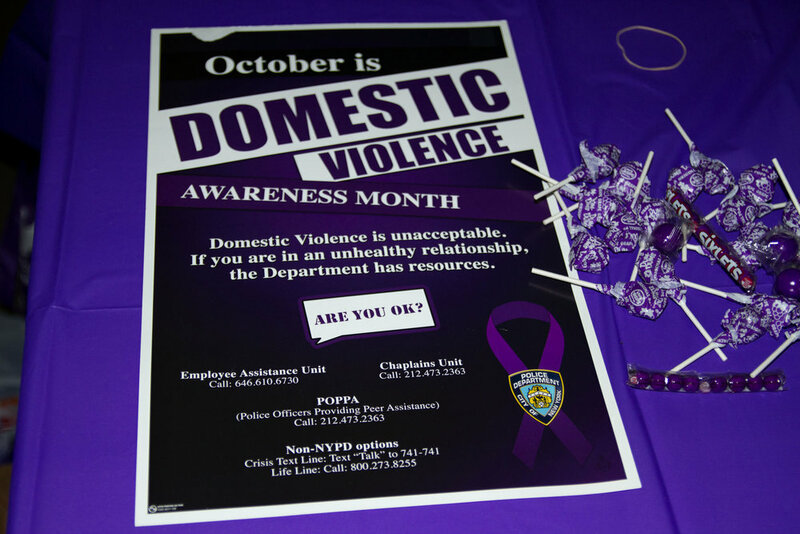 Michele Kaminsky, author and Director of the Bureau of Domestic Violence from the Brooklyn District Attorney's Office gave us some sobering statistics that drove home the pervasiveness of domestic violence in our community. You're certainly not alone, and she's working hard to make sure victims are supported with the resources they need. We had a surprise guest show up - police officers from the 6th Precinct joined us at the tables with important info and Officer O'Reilly got up and let everyone know that his mission is to help victims get to safety. 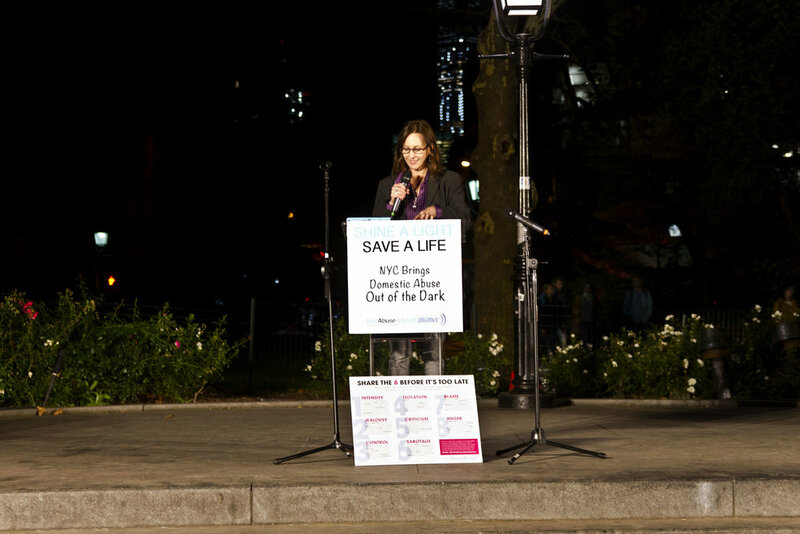 Our partner and Founder of the NYC Women's March and Women's March Alliance Katherine Siemionko brought it all home with a fierce poem that rocked everyone who heard it. 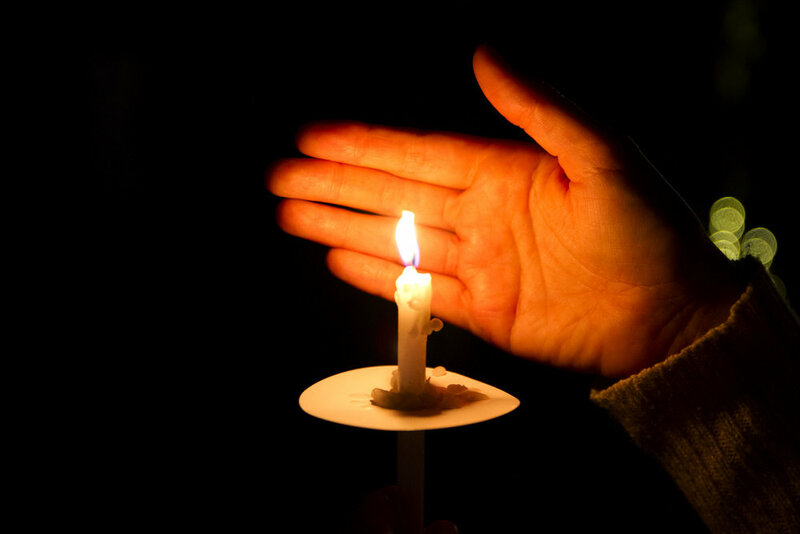 Following the arc of abuse from its charming inception to the bitter isolated end, Katherine found the perfect way to highlight that no victim sees it coming or asks for it. 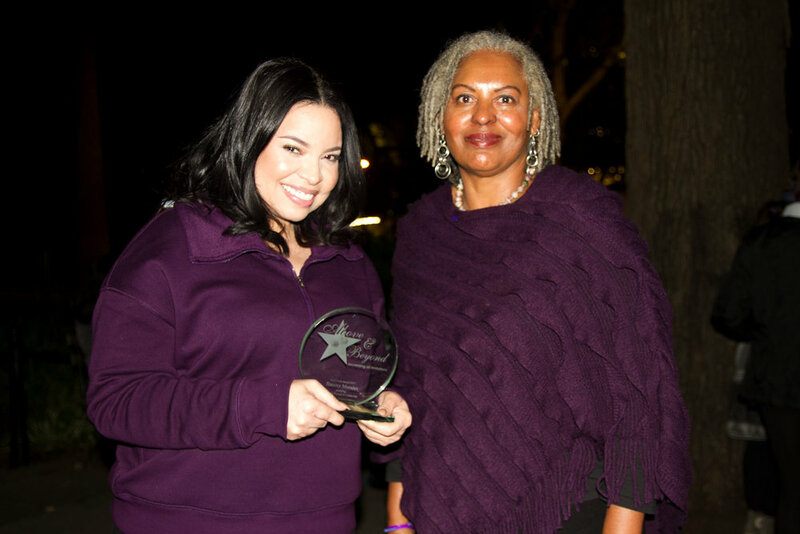 Ilianexy Morales, a courageous woman who survived being stabbed over 100 times, was presented the EndAbuse4Good 2017 Full Circle Award by Gwen Wright. Ilianexy eloquently and bravely shared her story which reminded every person there - abuse begins with charm, jealousy, and control. Just because a partner never lays a hand on you doesn't mean you're not in danger when you decide to leave. We also heard from Melissa Quesinberry of National Organization for Women who shared some vital stats that shook up our usual perception about domestic abuse and a few words from me - Aryn Quinn, Founder of EndAbuse4Good! 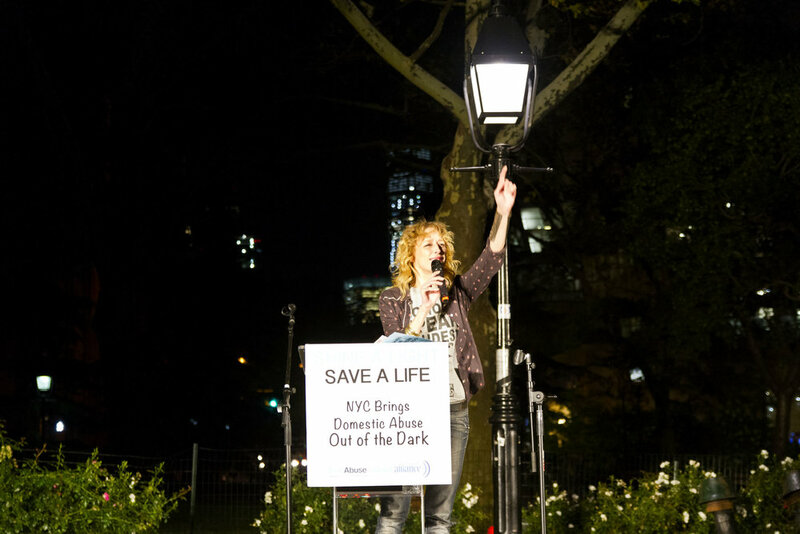 Sending us all off into the night to continue shining a light was the phenomenal Shannon Conley, lead signer of Lez Zepplin, with her sizzling rendition of Gloria Gaynor's I Will Survive. WOW!!! 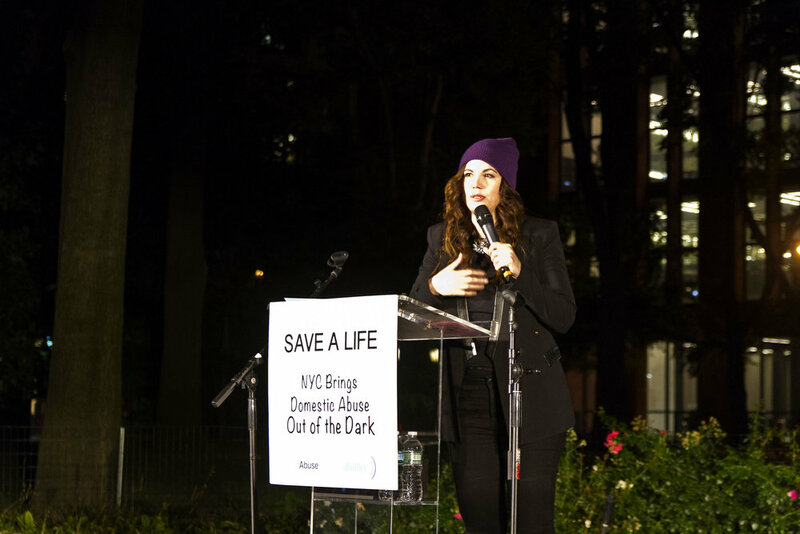 A perfect way to wrap up the 1st Annual Shine A Light Save A Life rally! See you next year with a brand new line up of performances and speakers! Volunteers make it all happen - you made the rally a success!